Before there was Aidan, there was Brendan. Thanks to Annelise for suggesting our Name of the Day. When Mark Wahlberg and Rhea Durham named their third child Brendan, many commented that it was nice to see a celebrity sticking to a classic. That’s the funny thing about baby names – yesterday’s trendy favorite can become hopelessly dated or it can enter our lexicon of acceptable, enduring choices. Brendan has transitioned gracefully. It helps that his roots are impeccably Irish. Legend has it that Saint Brendan the Navigator sailed across the Atlantic in the early 500s. He and a ship of believers were seeking the Garden of Eden; some versions of the tale suggest the crew beat Columbus to North America, defeating a sea monster en route. Odds are that Brendan’s voyage was a mix of folk tradition and religious parable, but his historical existence is unquestioned. He’s one of the Twelve Apostles of Ireland. The dozen monks all studied at Clonard Abbey and can be verified in historical records. In fact, a second Saint Brendan was among the twelve, Saint Brendan of Birr. 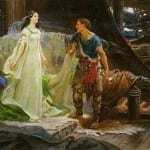 In sixth century Ireland, the men were probably called Bréanainn. There are a handful of meanings out there, but most agree that it comes from a title – “prince.” While I can’t trace the original source for the name, most agree that Brendan has a royal reputation. Lastly, a mash-up of Brendan’s Br- and Aidan have generated Braidan, Braeden, Braydon and too many more to list. 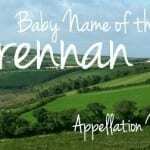 Like Brennan, they may trace their roots back to an Irish surname – but are undeniably boosted by the popularity of similar picks. Perhaps it is because he was never a chart-topper, or maybe it is because his history lends him some strength, but Brendan feels more like a 20th century classic than a fading favorite. If you’re looking for an Irish choice that is slightly less traditional than Daniel, far less common than Aidan and yet still current, why not consider Brendan? While the many similar choices could cause confusion, Brendan seems like the one most likely to endure as a strong choice for a son. Brendan was my favorite boys name for a while, I think it was when I was in high school. It’s completely off my list now because my nephew’s name is Brandon. I think it’s a cool name. I like that it’s not unusual, but has a more interesting sound than Brandon. Also I think it’s more likely to always be said in full. My nephew is more often called Bran, but I don’t think that would happen so much with Brendan, it just sort of rolls off the tongue better. I love Brendan! His sound is much fresher than Brandon to me; that could be because I knew a lot of Brandons around my age in school. But for me, Brendan also rolls off the tongue easier. I would definitely consider this for my own child one day but I think my other half rejected it. Oh well, hopefully Brendan will remain in steady use! And Lola, Brendyn is awful!! Especially since ‘y’ is so linked to girls’ names now and like you said, it doesn’t change the pronunciation at all. Brendan is fine. It doesn’t stand out to me much in a positive or negative light. I did/do know quite a few Brandon/ Brendan/ Brentons – they tend to be in their 20s and 30s, which is maybe the only thing that feels a little odd about naming a baby the same. But there’s certainly nothing offensive about the name for me. All in all, I wouldn’t bat an eyelash if I ran across a baby Brendan. I like Brendan. I have a friend with grandsons: Tyler & Brendyn. Yeah, She put the y in becuase “It’s said better that way” she said the last time I saw the kids. I think I said something along the lines of “It’s said the same spelled Brendan, too” and kind of left it there. I wasn’t about to argue the point beyond that and she didn’t pursue it. But I know she’s thinking about changing the spelling becuase he started preschool last fall and the kids are always spelling it Brendan, which is driving her bananas. I’ve got my fingers crossed she goes to the standard spelling.